Bradford Ice Arena01274 733535work Ice-skatingIce skating is a fun activity for all ages and abilities. Learning to skate can help improve coordination and balance; it is also hard work and therefore good for fitness! 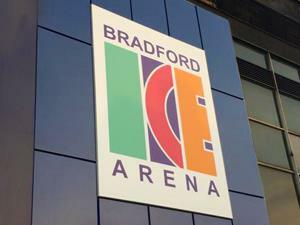 Come and join us for family skating sessions, professional ice skating lessons, watch a Bradford Bulldogs hockey game, join the Team Brilliance synchro skating team or just have fun at our discos. The cafe is an ideal place to have a break and we have a variety of hot and cold food for sale in a warm environment. Ice skating is a fun activity for all ages and abilities. Please go to www.bradfordicearena.co.uk/public-sessions/ for times and prices. Please go to www.bradfordicearena.co.uk/public-sessions/ for admission fees. The ice arena is on the first floor above Mecca Bingo and adjacent to the National Museum of Film Photography and Television. Other nearby landmarks are the Alhambra Theatre and the Central Police Station. To find us follow signs for the City Centre or the Museum marked "P" on the map. The arena is also in easy reach of the Bradford Interchange (bus and trains).